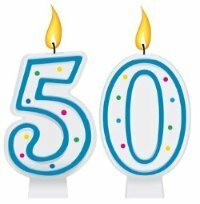 Your easy guide to celebrating the BIG 5 - 0! This birthday, perhaps more than any other, is a time for reflection. Most people will be at a stage in their lives where they have a pretty good idea how things are, what they are likely to achieve, and how to get there. Hopefully they also have some achievements behind them; either at work, in their social situation, or, most commonly, in bringing up their children. 50 too is a time of intrigue. How will it be from now. Not yet old but no longer young. How can you feel fine inside but are starting to notice the effects of time on your body! Try as you might to pass it off 50 is also noteworthy to those around you - family, friends and work colleagues. The ideas on these pages are really for them. For those planning a 50th birthday party. For those people looking for great 50th Birthday Ideas to make that special milestone even more special!